Hobfoll’s Conservation of Resources (COR) theory of stress posits that resource loss is a central mechanism that determines stress reactions[1,2]. Underpinning Hobfoll’s model is the notion that people have a basic need to acquire and protect resources, and stress occurs when these resources are threatened, perceived to be threatened, or actually lost. Previous studies have examined the impact of resource loss and gain in various populations, yet it is critical to understand resource loss in underserved populations. Few studies have examined resource loss in women with histories of substance use problems who had previous involvement with the justice system. There is reason to believe that resource loss manifests differently depending on the population. Whereas traditional theories of stress emphasize an individual’s response to an appraisal of a specific event, one of the central tenets of COR theory is that stress can be culturally and context-specific. Because COR stipulates that stress depends on the ability to attain resources, not all types of resources (i.e., personal, social, or material) are equal and may have differential effects depending on the population experiencing the loss[5-8]. Studying resource loss in a population of primarily minority women with substance use histories can show how systemic stressors, such as one’s place in society, may affect an individual’s stress. In underresourced populations, the notion of societal stress becomes especially salient. First, losing resources has been found to have a stronger psychological impact than gaining resources, a phenomenon referred to as “loss-salience,” or the “primacy of resource loss”[1,7,10]. In a study of inner-city women, the negative effect of economic loss (e.g., stress and worry) overshadowed the positive effect of economic gains[2,10] (e.g., comfort and stability). Second, underresourced populations may be subjected to “loss spirals,” a phenomenon that occurs when there are few resources available to offset and protect one from losing more. Evidence of loss spirals has been found in individuals experiencing job burnout and those who have been exposed to violence[11-13]. It is important to note that what propels someone into a loss spiral is not mismanagement of resources or inability to employ resources properly, but that one seeks short-term immediate gains that may be self-defeating in the future. There is currently a gap in the COR literature with respect to resource loss observed in samples of minority women, who also occupy lower socioeconomic strata. The one study that did examine COR in this population focused on examining losses related to objects and materials rather than interpersonal conflict and loss of intimate others. The investigators argued that the stress from object and material loss was most salient in this sample of women. Furthermore, given the vulnerable and transient nature of this population, the researchers stated that concentrating on material loss in this sample avoided confounds of interpersonal conflict and loss of intimate others. But there is reason to believe that other resources, like social and personal characteristics, are just as important as material and object resources to underserved or marginalized populations. For example, in a population of individuals who experienced homelessness, improved quality of life was associated with not only income and employment, but also with social support and belonging to a community. In the current study, we examined how all aspects of the conservation of resources evaluation of loss (CORE-L) behave in a group of women with substance abuse histories who have also been involved in the criminal justice system. Given resources within COR are sensitive to sociocultural factors, and the women who comprised our sample were systemically underresourced, the current study explored the understanding of social stressors related to those who have had problems with substance use and a criminal history. Because previous work utilizing the conservation of resource evaluation loss (CORE-L) measure showed that the factor structure differed depending on the research population[5,15]. we initiallyconducted a factor analysis to understand which aspects of resource loss were most prevalent in this sample. We hypothesized that the women in our sample would primarily report loss of economic resources. Participants completed a two-hour interview. We collected data on the types of criminal charges for which participants had been arrested, their previous criminal histories, drug use and misuse histories, and the number of arrests and months incarcerated. In addition to demographic questions, participants completed several psychological measures. Resource Loss. Resource loss was measured by the Conservation of Resources-Evaluation[1,5]. The version of COR-E utilized in this study was a 45-item measure assessing perceived loss of various types of resources (e.g., transportation, health of family members, adequate food, and good relationship with my children). Participants were asked to rate how much they felt they lost each item over the previous three months (e.g., “housing that suits my needs”.) on a 5-point scale (1 = not at all to 5 = greatly). COR-E is widely used and has been shown to be both reliable and valid. Cronbach’s alpha for our sample on this measure was 0.97. Empowerment was measured by the Personal Progress Scale Revised. This measure is designed to measure several components of empowerment, (e.g., awareness of participation in the community, knowledge about resources in the community, personal evaluation). Items from this measure include statements such as “I am aware of my own strengths as a woman” and “I am aware of places in my community that will help me find jobs”. Participants rated the frequency with which they identified with each statement on a scale from 1 (almost never) to 7 (almost always). Higher scores indicated higher feelings of empowerment. Cronbach’s alpha for our sample was 0.87. Depressive symptomatology was measured by theBeck Depression Inventory-II. The BDI is a 21-item self-report measure that asks participants about the severity of depressive symptomatology experienced over the previous two weeks. For each symptom, participants choose the option that is most indicative of their feelings over the previous two weeks. (e.g., Self-Dislike: 0. I feel the same about myself as ever; 1. I have lost confidence in myself; 2. I am disappointed in myself; 3. I dislike myself). Higher scores correspond to higher levels of depressive symptomatology. Cronbach’s alpha for our sample was 0.92. 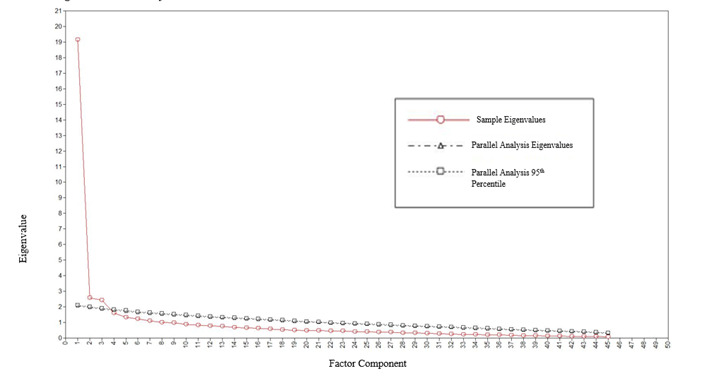 We conducted five sets of analyses: 1) descriptive analyses of the sample’s resource loss and empowerment scores 2) an exploratory factor analysis (EFA) to replicate the dimensions of the CORE-L measure from previous studies 3) a corrected item total correlation (CITC) to reduce items in the CORE-L, 4) a confirmatory factor analysis (CFA) to measure the validity of the items derived from the CITC, and 5) regression analyses using items derived from the CITC to predict scores on the Personal Progress Scale-Revised (PPS-R) and Beck’s Depression Inventory (BDI-II). We computed descriptive statistics on our variables of interest: resource loss, empowerment, and depressive symptoms. On average, women in our sample perceived themselves as having had much change in resource loss (M = 1.93, SD = 0.85), high feelings of empowerment (M = 5.16, SD = 0.84), and low depressive symptoms (M = 0.51, SD = 0.46). See Table 1. Preliminary analyses were conducted on the 45-item CORE-L to assess whether the data were appropriate for an EFA. The Kaiser-Meyer-Olkin Measure of Sampling Adequacy (KMO = .92) indicated the matrix was suitable. Bartlett’s test of sphericity was significant [χ² (990) = 6070.24, p < .0001], indicating that correlations between items were sufficient for EFA. A parallel analysis was conducted to determine the appropriate number of factors to extract. The parallel analysis suggested that three factors adequately fit the model (see Figure 1). An exploratory factor analysis was conducted forcing three factors using oblique rotation and MLR estimation. The Geomin rotated factor loadings on the three factor solution demonstrated that there were a number of cross-loadings and other items that did not load onto any one single factor. We proceeded to force a 2-factor solution which, again, yielded several cross-loadings (see Table 2). Further reductive analyses were deemed necessary in order to better understand resource loss within the sample. 40. Involvement with church, synagogue, etc. To obtain a concise measure of loss, we ran corrected item total correlations on the 45-item CORE-L scale. We then iteratively took out items one-by-one until all corrected item total correlation loadings for the remaining items were above 0.75. Five items remained using this method. One item (motivation to get things done) was removed because of high residuals correlating with the other items (see Table 3), leaving a final scale of 4 items. To assess whether our reduced, 4-item measure of CORE-L was reliable, we used the Spearman-Brown prophecy formula[21,22]. The expected reliability of a 4-item solution, based on the formula, was .72. Given that reliability for our 4-item measure was much greater than .72 (α = 0.92), we concluded that our reduced scale had high reliability. A confirmatory factor analysis was conducted on the four-items yielded from the CITC. This was done to demonstrate that the four item solution derived from the CITC was a strong fit. These four items adequately fit the model (Table 4). Regressions were used to assess the association of resource loss and empowerment. Resource loss, as measured by the CORE-L, was entered as a predictor with empowerment, as measured by PPSR, as the outcome. We ran separate regressions with the 45-item measure as a predictor and with the 4-item measure as a predictor. There was a significant negative relationship between the 45-item CORE-L scale and feelings of empowerment (B = -0.008, p < 0.00), suggesting that the higher the one’s feelings of experienced resource loss, the lower one’s feelings of empowerment. This finding was replicated with the 4-item CORE-L, as there was a significant negative association between the 4-item CORE-L scale and PPSR (B = -.078, p < 0.00; see Table 5). Regressions were also used to assess the association between resource loss and depressive symptoms. Resource loss, as measured by the CORE-L, was entered as a predictor with depressive symptoms, as measured by BDI scores, as the outcome. We ran separate regressions with the 45-item measure as a predictor and with the 4-item measure as a predictor. There was a significant positive relationship between the 45-item CORE-L scale and depressive symptoms (B = .111, p < 0.00), suggesting that the more one experienced resource loss, the greater the depressive symptoms. This finding was replicated with the 4-item CORE-L, as there was a significant positive association between the 4-item CORE-L scale and BDI (B = 1.021, p < 0.00, see Table 6). This study examined resource loss in a sample of justice- involved women who have previously had problems with substance abuse. Many of the women in our sample were underresourced. Given that resource loss manifests differently in diverse populations (e.g., a group of individuals with post-traumatic stress will value different resources than a group of people who experienced homelessness), we expected that the women in our sample would report loss of economic resources the most. But the resources that were found to be highly correlated among the women who comprise our sample were what we have termed “self-resources.” These resources were hope, sense of optimism, feeling life has purpose/meaning, and positive feelings about oneself. To arrive at an accurate portrayal of loss, we ran a factor analysis to understand how the conservation of resources model would function in this particular sample of women. However, our 3-factor solution had many cross-loadings, and a 2-factor solution did not provide clear factors. After item reduction, we found that hope, sense of optimism, feeling life has purpose/ meaning, and positive feelings about oneself were highly correlated. A similar method exploring the COR-E was utilized by, which reduced a 52-item scale modified from Hobfoll et al. to a 19-item scale. These 19 items included internal and external resources, such as companionship, time with loved ones, and adequate sleep. The resources that highly correlated in our sample differed in that the 4-items were internal, or self-resources, which may prove to be valued in this particular underresourced group of women. The fact that our findings reveal self-resources is especially interesting in this research sample. Given that the women in our study were recently released from substance use treatment or jail, one would expect for them to have experienced a spiral of losses. However, given these self-items were so highly correlated, it may be that when leaving such institutions, these resources are especially valuable. An additional explanation for these items correlating with one another is that dozens of the items on Hobfoll’s 45-item measure may not pertain to women leaving jail or substance abuse treatment. Items such as medical insurance, money for transportation or time for work may not have been applicable at the time of the interview. This may also account for one of our studies limitations, which was a lack of variance among the answers. The vast majority of the responses revealed items such as medical insurance having not been lost at all. There is sufficient reason to believe that this item and other similar items were not valued at the time of the interview, or that the individuals never had such a resource in the first place, meaning, one cannot lose what she never had. The finding that the four items that highly correlated were related to characteristics and perception of self may be why we found a significant relationship with empowerment and depression. Empowerment and depression are believed to relate to certain intrapersonal characteristics[23,24]. Yet our findings reveal that the 45-item measure was similarly associated to empowerment and depression. This may suggests that the 4-items in the reduced measure were the primary reason for the results, or that feeling loss of any resources is related to feelings of empowerment and depression. Future research should delineate whether all resources are valued similarly with regard to empowerment and depression. Another limitation is that our data were skewed. The MLR estimation, while robust against some violation of normality, may still not yield optimal solutions. However, alternative techniques involving assumptions of distribution are largely experimental at this time. Perhaps one reason that the data were skewed is due to the nature of the COR measure; individuals are asked how much they feel they have lost something over some period of time. However, it may be difficult for participants to quantify how much they have lost something, especially if they feel they never had it in the first place. Perhaps a better way to measure resource loss is to ask people more generally how they feel about a resource at a given time, and assess if their feelings about specific resources changesat different time points. This is similar to the method employed in Zwiebach et al.’s study where change scores were calculated for resource loss based on ratings at two separate time points. This gave the investigators variability in resource change scores, which enabled them to categorize their participants into separate groups depending on their resource loss: high resource loss, resource gain, and resource stable. The notion that resources can be framed in larger sociocultural constructs creates a space to examine how one’s stress can be influenced by her environment. People with criminal histories and substance abuse carry with them a stigma imposed by the environment in which they find themselves living in. To understand environmental stressors which occur at systemic levels, theories such as COR are especially relevant today because they more accurately reflect the sociocultural context of individuals’ experience. Though hope, sense of optimism, feeling that life has purpose/meaning, and positive feelings about oneself were found to be specific to this sample, perhaps future research working with populations in the field of criminal justice and the addictions may inquire about these self-resources. 1. Hobfoll, S. E. Conservation of resources: A new attempt at conceptualizing stress. (1989). Am Psychol. 44(3): 513-524. 2. Hobfoll, S. E., Johnson, R. J., Ennis, N., et al. Resource loss, resource gain, and emotional outcomes among inner city women. (2003). J Pers Soc Psychol. 84(3): 632-643. 3. Thoits, P. Self, Identity, Stress, and Mental Health. (2013). Handbook of the Sociology of Mental Health. 357-377. 4. Hobfoll, S. E. Social and psychological resources and adaptation. (2002). Review of General Psychology. 6(4): 307-324. 5. Hobfoll, S. E., Lilly, R. S. Resource conservation as a strategy for community psychology. (1993). Journal of Community Psychology. 21(2): 128-148. 6. Hobfoll, S. E., Tracy, M., Galea, S. The impact of resource loss and traumatic growth on probable PTSD and depression following terrorist attacks. (2006). J Trauma Stress. 19(6): 867-878. 7. Hobfoll, S. E. The Influence of Culture, Community, and the Nested-Self in the Stress Process: Advancing Conservation of Resources Theory. (2001). Applied Psychology. 50(3): 337. 9. Zwiebach, L., Rhodes, J., Roemer, L. Resource loss, resource gain, and mental health among survivors of Hurricane Katrina. (2010). J Trauma Stress. 23(6): 751-758. 10. Wells, J. D., Hobfoll, S. E., Lavin, J. When it Rains, it Pours: The Greater Impact of Resource Loss Compared to Gain on Psychological Distress. (1999). Pers Soc Psychol Bull. 25(9): 1172-1182. 11. Demerouti, E., Bakker, A. B., Bulters, A. J. The loss spiral of work pressure, work–home interference and exhaustion: Reciprocal relations in a three-wave study. (2004). Journal of Vocational Behavior. 64(1): 131-149. 12. Heath, N. M., Hall, B. J., Russ, E. U., et al. Reciprocal relationships between resource loss and psychological distress following exposure to political violence. (2012). Anxiety Stress Coping. 25(6): 679-695. 13. Ten Brummelhuis, L. L., Ter Hoeven, C. L., Bakker, A. B., et al. Breaking through the loss cycle of burnout: The role of motivation. (2011). Journal of Occupational & Organizational Psychology. 84(2): 268-287. 14. Lam, J. A., Rosenheck, R. A. Correlates of improvement in quality of life among homeless persons with serious mental illness. (2000). Psychiatric Services. 15. Freedy, J., Saladin, M., Kilpatrick, D., Resnick, H., et al. Understanding acute psychological distress following natural disaster. (1994). J Trauma Stress. 7(2): 257-273. 16. Jason, L. A., Salina, D., Ram, D. Oxford Recovery Housing: Length of stay correlated with improved outcomes for women previously involved with the criminal justice system. (2015). Subst Abus. 00-00. 17. Ennis, N. E., Hobfoll, S. E., Schroder, K. E. E. Money doesn't talk, it swears: How economic stress and resistance resources impact inner-city women's depressive mood. (2000). Am J Community Psychol. 28(2): 149-173. 18. Johnson, D. M., Worell, J., Chandler, R. K. Assessing Psychological Health and Empowerment in Women. (2005). Women & Health. 41(1): 109-129. 19. Beck, A. T., Steer, R. A., Brown, G. K. Manual for the beck depression inventory-II. (1996). 20. Brown, W. Some experimental results in the correlation of mental abilities. (1910). British Journal of Psychology. 3(3): 296-322. 21. Spearman, C. E. Correlation calculated from faulty data. (1910). British Journal of Psychology. 3(3): 271-295. 23. Hunter, B. A., Jason, L. A., Keys, C. B. Factors of Empowerment for Women in Recovery from Substance Use. (2013). Am J Community Psychol. 51(1-2): 91-102. 24. Perrig-Chiello, P., Hutchison, S., Morselli, D. Patterns of psychological adaptation to divorce after a long-term marriage. (2015). Journal of Social and Personal Relationships. 32(3): 386-405. 25. Muthen, B., Asparouhov, T. IRT studies of many groups: the alignment method. (2014). Frontiers in psychology. 5.